At five months old Amalia was diagnosed with dystonic cerebral palsy, a condition which prevents her muscles from responding accurately to the messages her brain sends. Amalia has the most severe form of cerebral palsy, causing quadriplegia, which means that her arms and legs are affected, as well as the muscles of her trunk, face and mouth. This impacts all aspects of Amalia’s daily life, including her mobility, her ability to eat, drink and swallow, her speech and her fine motor skills. 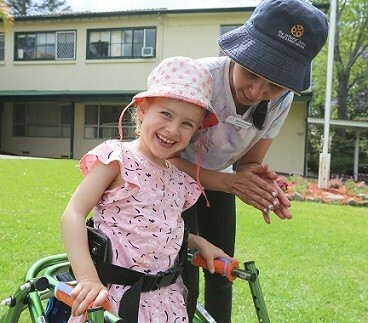 Each week she participates in physiotherapy, speech therapy, occupational therapy and daily life skills education classes at The Infants’ Home and with her external therapists. 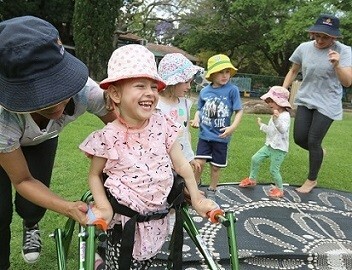 Despite the physical challenges she faces, Amalia functions at a normal cognitive level, and she’s keen to do everything other preschoolers do – play, learn and socialise. She’s very outgoing and loves being with children her own age, although sometimes it can be difficult for her to physically keep up with their pace. 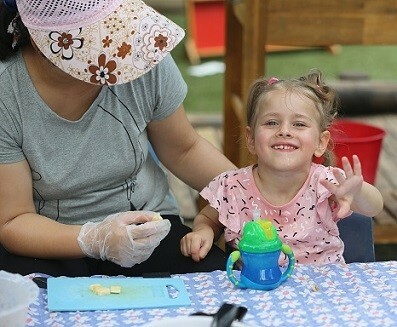 Before coming to The Infants’ Home at two and a half years of age, Amalia attended her local child care centre, but was only able to go there for five hours a day, when an additional staff member was there to support her. Amalia’s mum Katarina wanted to find a more inclusive child care setting for Amalia, but this wasn’t easy given the high level of support she requires. After contacting 10 local centres, Katarina learned about The Infants’ Home. Our Health and Early Childhood Consultant Meryl Burn immediately reassured Katarina that we could meet Amalia’s needs. Health team were determined to help Amalia achieve this small but very significant victory. After much trial, error and practice, Amalia now easily uses a two handled cup with a straw. Katarina is thrilled with the new level of independence that Amalia has gained with the acquisition of this everyday skill, and it is also a great relief as she no longer has to constantly offer Amalia water because Amalia is unable to communicate that she’s thirsty. Her Educators and the Allied Health team also played a vital role in helping Amalia learn to use the bathroom on her own, which was a huge achievement given the challenges of managing this skill while also using a walker for mobility. Amalia is getting ready to start primary school next year, and she’s extremely excited about this next big step. Johnson House Preschool director Amy and Allied Health professionals Justine (Occupational Therapist) and Simone (Speech Pathologist) have been meeting with the mainstream schools that Katarina is considering to plan for Amalia’s transition. They will help the schools to begin preparing to meet Amalia’s needs within the primary school setting.